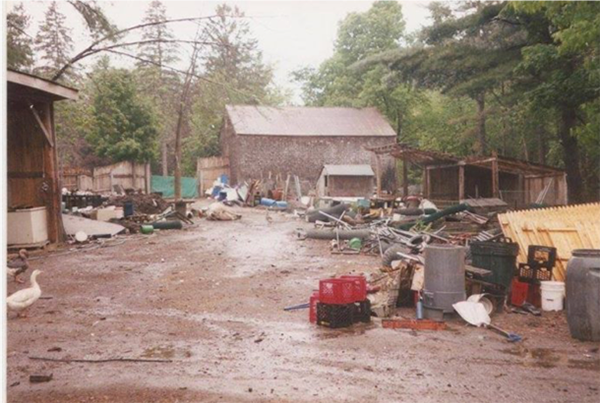 In 1998, Maine officials temporarily revoked DEW Haven’s exhibitor permit due to “failure to comply with state standards and regulations regarding the lawful and humane treatment of wildlife in captivity.” That year, federal authorities at the USDA fined them $4,500 for violations of the Animal Welfare Act. An excerpt from a 1998 state investigator’s report. 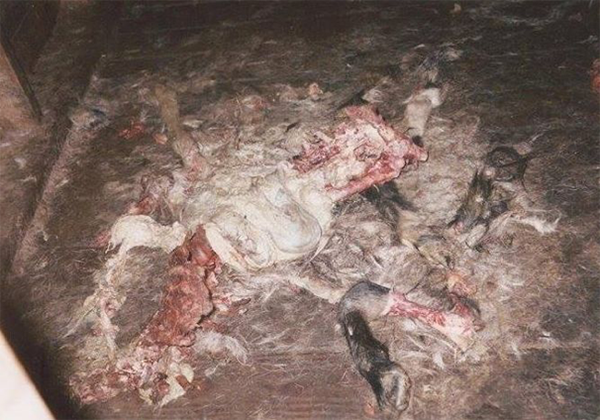 The investigation resulted in the temporary revocation of DEW’s exhibitor’s permit, and later that year, DEW was fined by the USDA for failing to comply with the Animal Welfare Act. Although DEW Haven claims to be a sanctuary for rescued animals, most of their animals were born on-site or purchased from other private zoos. 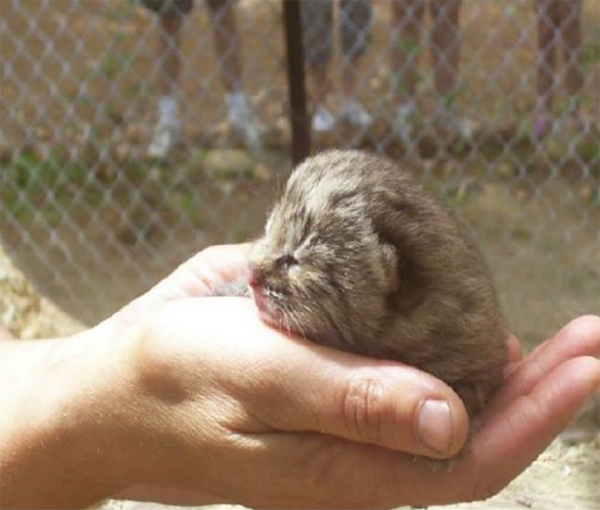 Unlike a true sanctuary, they routinely breed, buy, sell, and allow public contact with their animals, including newborn big cat cubs which are taken from their mothers immediately after birth for lucrative “encounters” with the public (an extremely inhumane practice which no legitimate facility would ever do). Former volunteers report that animals no longer wanted at DEW Haven are often “shot, sick, sold, traded, skinned and mounted, and some just disappear.” And although DEW claims to be run on a shoestring budget and begs for more donations to help their animals, the organization’s tax returns show significant annual profit going into the pockets of the owners, with very little of the public’s “donations” spent on animal care. 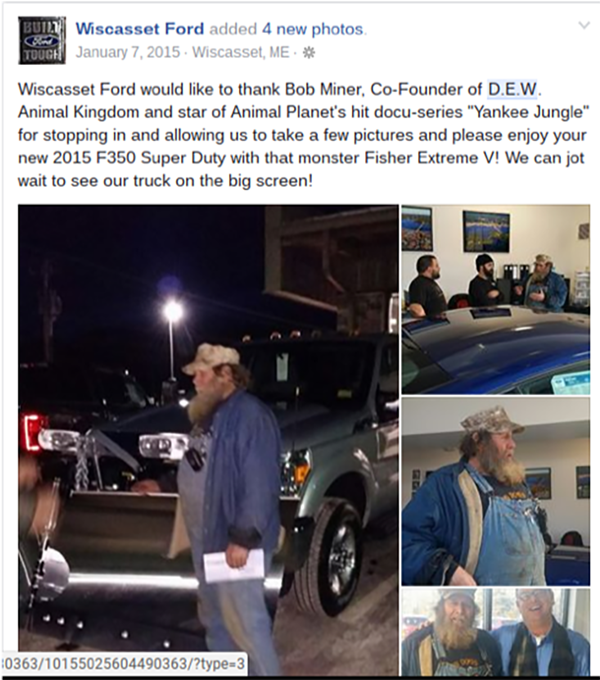 DEW is owned and operated by Bob Miner, a convicted felon with a 14 page long criminal record. Miner has been found guilty of seven felonies and four misdemeanors since 1981, including multiple counts of felony burglary, receiving stolen property, theft by unauthorized taking, illegal ownership of firearms, and misdemeanor assault. 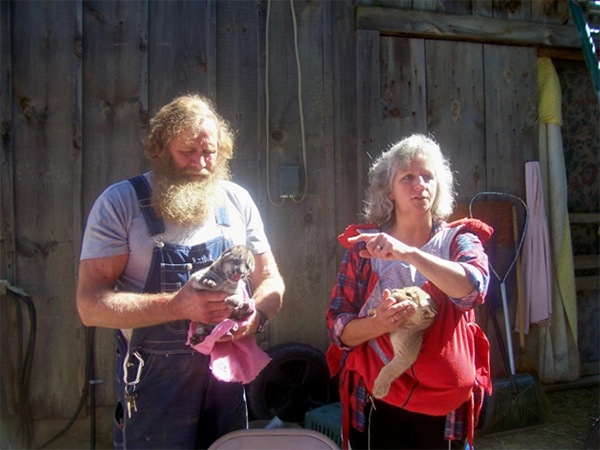 Bob and his wife Julie are not accredited by any legitimate organization, have no formal education in caring for exotic animals, and have admitted to the press that they consider their facility a “farm” and their exotic animals as nothing more than “alternative livestock.” As recently as April 2016, the Miners proudly told the Portland Press Herald that they consider themselves “fly-by-the-seat-of-your-pants-type people” and refused to allow a reporter access to their property. Bob Miner has a history of threatening and intimidating anyone who criticizes DEW. In 2002, he was arrested for harassment of a neighbor who criticized his operation, and in 2004, courts issued a temporary restraining order against him after he threatened former DEW volunteer Monica Hooper at a supermarket. DEW Haven has been fined multiple times by the USDA for chronic violations of the Animal Welfare Act. 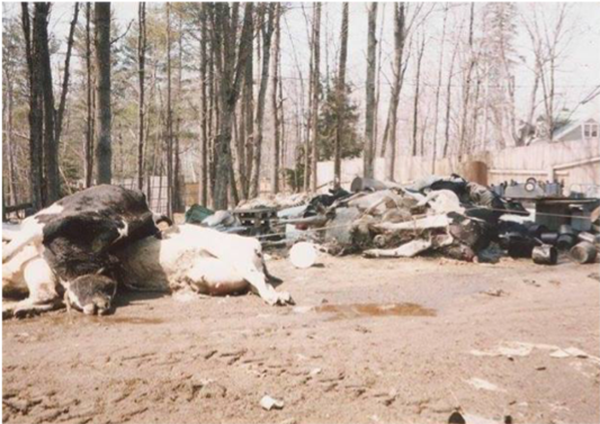 In March 1998, DEW was fined $4,300 after inspectors witnessed injured animals, contaminated feed, and dangerous fencing. The USDA gave the Miners two options: they could pay the fine outright, or they could take that same money and use it to remedy the problems, with the condition that they show how the money was spent to improve the facility. DEW declined to improve their facility and chose to pay the fine directly. 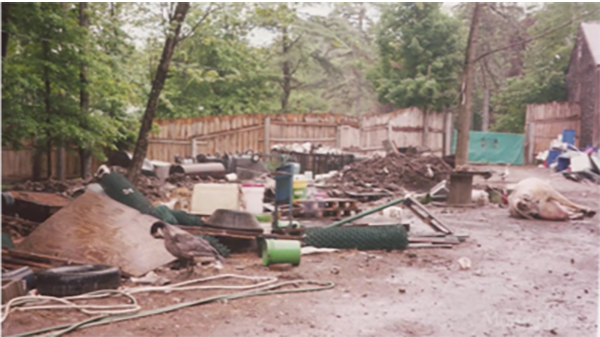 Piles of garbage and feed waste with “waste odor” were found behind animal enclosures, and a fly infestation was reported near a cougar cub’s pen. Perimeter fences to keep the public away from adult lions and bears were inadequate or non-existent. Some animal feed was expired or contaminated with feces. Visitors were allowed to interact with an 8 month old, 130 lb. tiger which was far too large and dangerous to legally come in contact with the public. 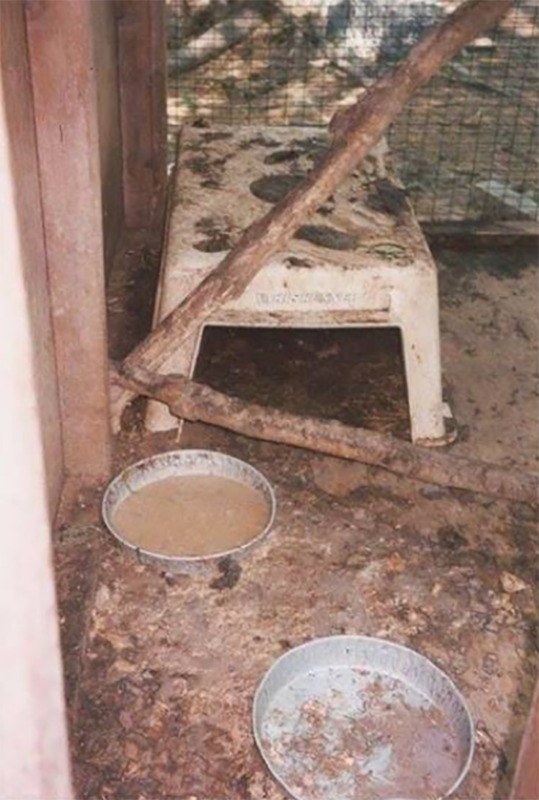 Shelters for tiger and lion cubs were inadequate and too small for the animals to have freedom of movement. 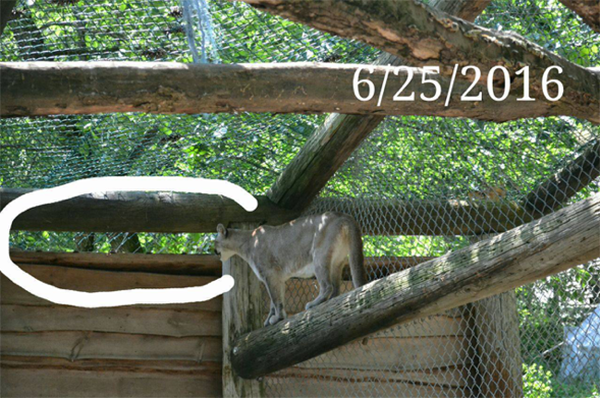 A shelf in the black leopard enclosure was poorly-maintained and “could cause injury” to the animal, and a crowbar was left on the ground in the bobcat enclosure. There were “considerable unhygienic conditions” in the food preparation area. 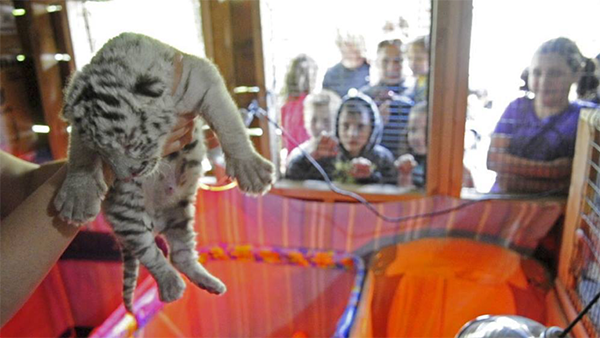 The public was allowed to interact with an adult tiger at distances “insufficient to assure safety,” and dangerous gaps were noted in the zebra enclosure. 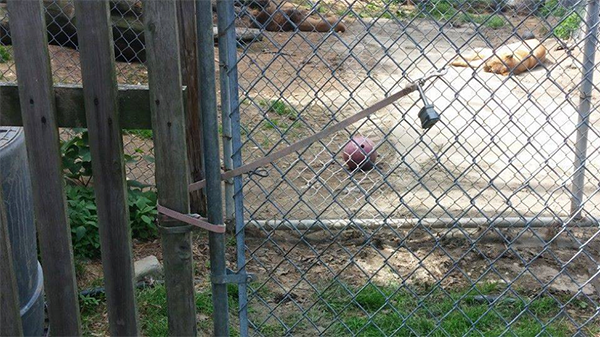 Unused fencing, construction materials, and other trash was repeatedly found on the ground inside animal enclosures. 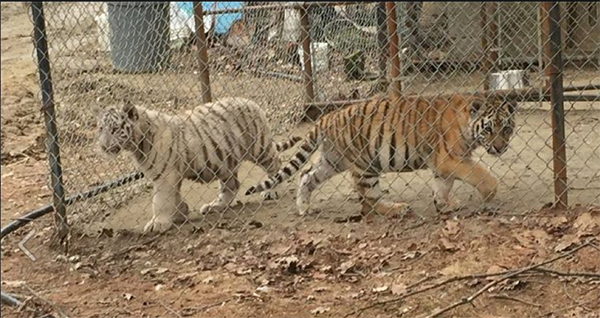 Three adult tigers were being kept in enclosures insufficient to ensure their containment. 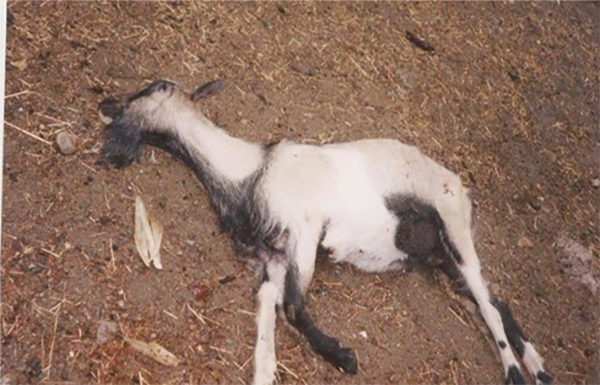 A goat was observed with an “excessively long hoof” which could cause lameness. A livestock trailer used to transport animals had rusted out in some areas. 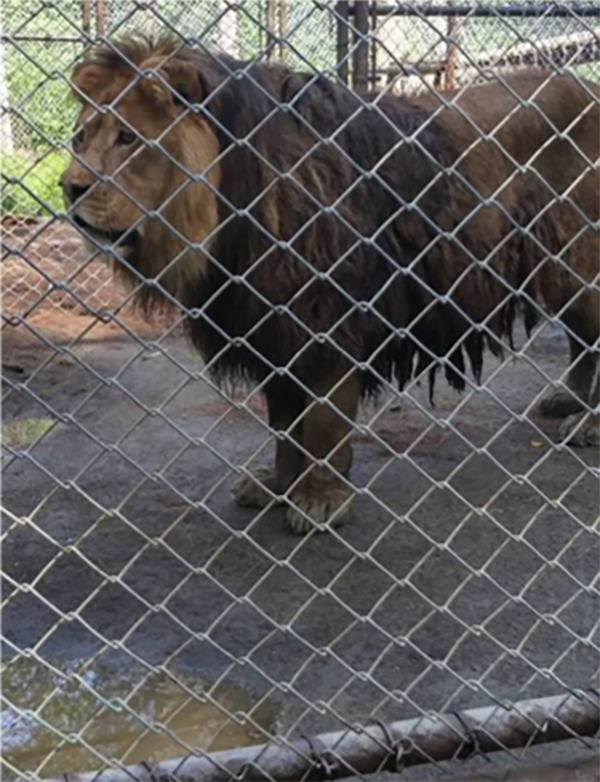 Two adult lions were housed in an enclosure with no roof to prevent escapes and no provision for shade. An illegally-imported black bear cub was found in a cage, and a crested macaque had also been imported without the required permits. 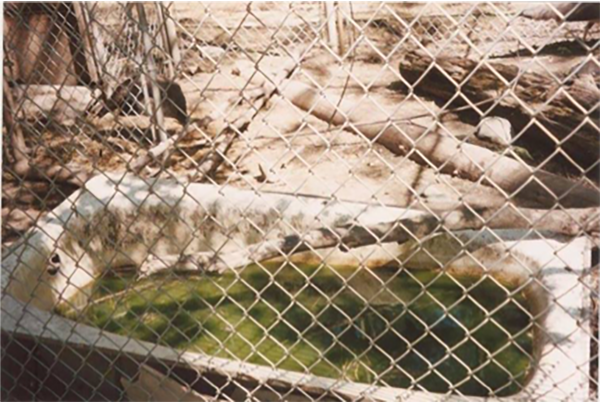 Many of the enclosures did not have adequate shelter for the animals to seek relief from the elements, and most animals had dirty water or no water at all. 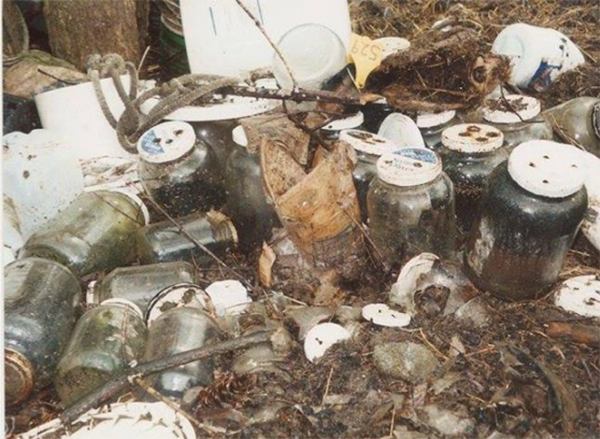 Drinking water and food dishes were dirty, and rats were seen at the facility. There was no written plan of action in the event of a disaster. 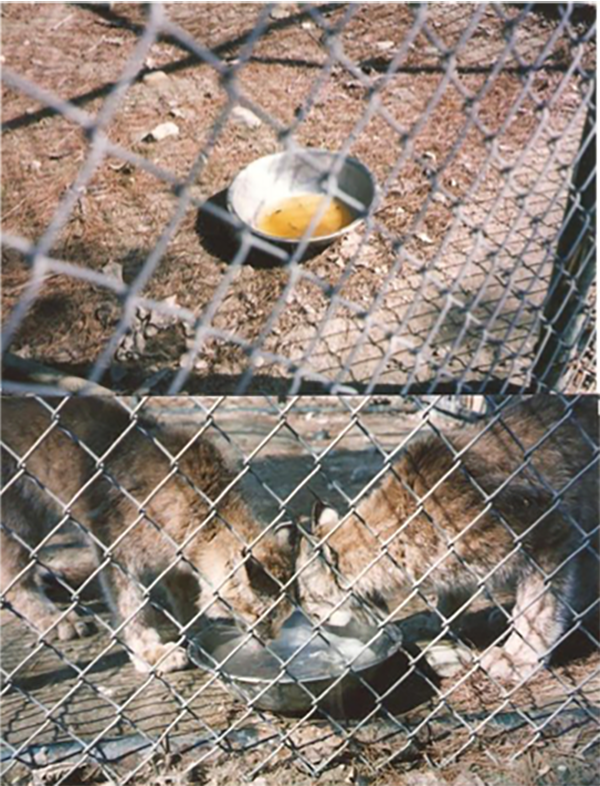 Two bobcats were housed in enclosures with dirty water and no perch as required by state law. As a result of this investigation, the state of Maine suspended DEW’s exhibitor permit for 90 days. The Miners cleaned up their facility and were allowed to resume operations, but quickly reverted to their old ways as soon as the permit was reinstated. 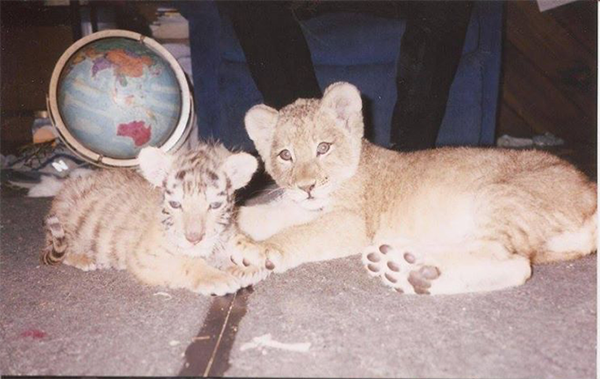 In May 2002, federal and state officials confiscated three illegally-imported cougars and a ringtailed lemur from DEW Haven. 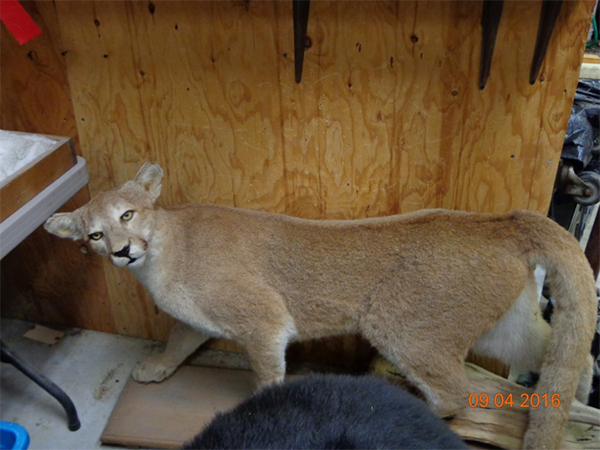 One of the cougars, Zach, had been left with bloody, abscessed paws after authorities suspect Bob Miner attempted to declaw the cat himself. The state’s report on a veterinarian’s assessment referred to the declaw as a “butcher job” which left Zach “crippled” and unable to walk. A volunteer’s photo of a cougar’s abscessed paws before he was seized by the state. 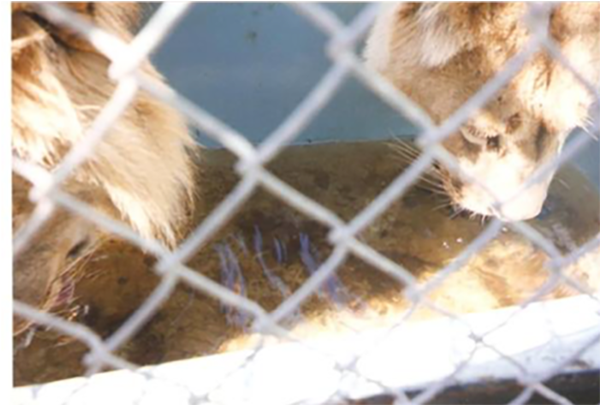 Many of the animals being held do not have access to water. This is required by law, and no excuse no matter how dramatic can ameliorate this transgression. In each instance that water was not provided, a ready excuse was forthcoming, as to why this particular animal’s behavior (i.e. he knocks over his dish) prevented it from having access to water. I indicated to the Miners that this was unacceptable from the state’s point of view and steps must be taken to ensure that all animals have water available to them whenever they want it. 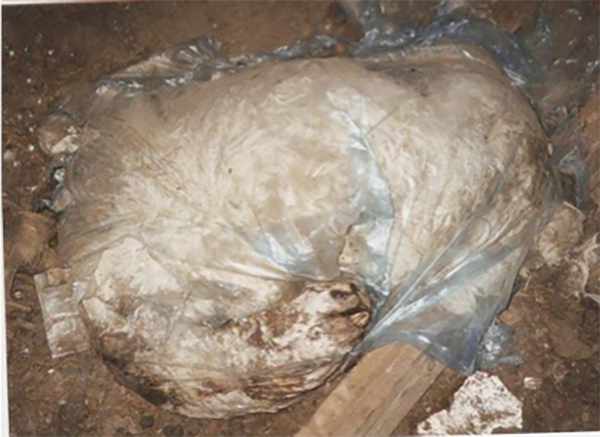 Dead, decaying carcasses continue to be a problem. The current condition at DEW is unacceptable to any reasonable person. 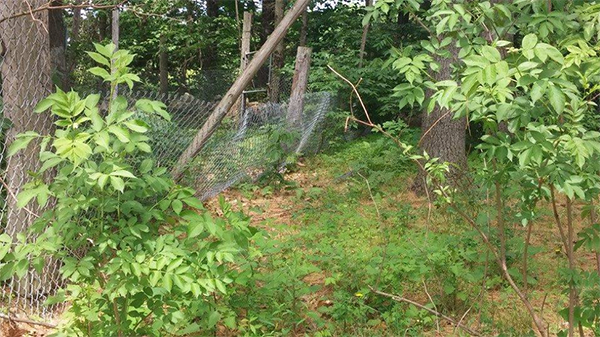 One cage contained two carcasses of what appeared to be geese. According to Julie Miner, these geese were killed by a Great Horned Owl this past winter. It appears that no one thought to remove these carcasses to an appropriate disposal facility. They were allowed to decay within the pen, in plain sight of the public. I observed bones, heads, hides, cast randomly about the property. 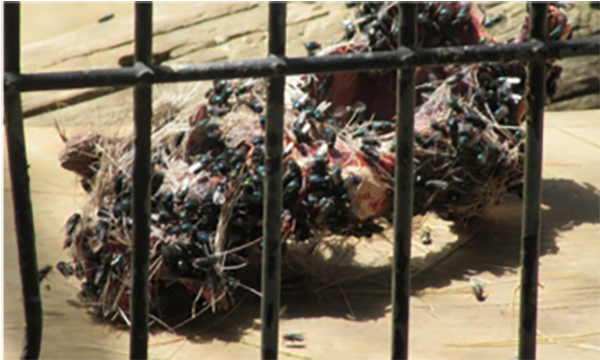 A dead, bloated calf with approximately 1 billion flies was observed, just south of the Camel pen. In looking at the paper work associated with many of these animals, it appears that there is a tremendous amount of “donating” being made between animal propagators. These animals are changing hands yet, they are almost always “donated” from one propagator to the other. A normal circumstance would necessitate some payments and exchange of money. This is the only industry I know where everybody seems to donate to each other, “on paper.” I believe all of these “donations” are to cover the illegal trade of wildlife. This is sheer opinion on my part. Mr. Clem Dussault informed me that in 1998, DEW Animal Kingdom had to resolve a complaint of similar violations with [the USDA]. DEW was offered two options. They could pay an outright fine of approximately $4300.00 or in lieu of the fine, they could take that same money and put it into the facility to remedy the problems identified by the complaint. If the second option was chosen they would have to show how the money was spent to improve the facility. DEW chose to pay the fine outright as opposed to putting the money into their facility to solve the problems identified in the complaint. 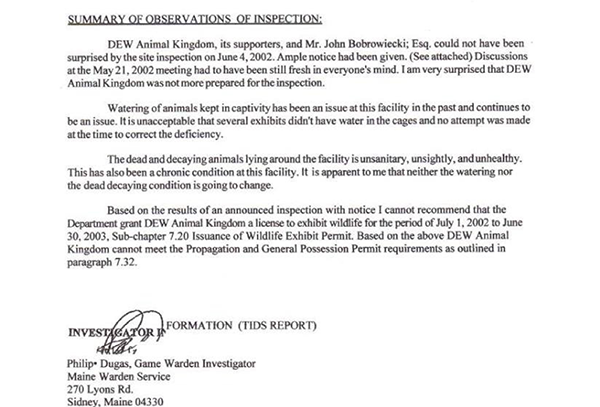 After this inspection, the Kennebec State-Journal reported that Maine’s Department of Fisheries and Wildlife “was not going to renew [DEW’s] license” for 2002 because the facility “failed to comply with state standards and regulations regarding the lawful and humane treatment of wildlife in captivity.” However, after the Miners negotiated with state officials and made some improvements to their facility, the department suddenly changed its mind and decided to renew DEW’s permit against the recommendations of state and federal inspectors. 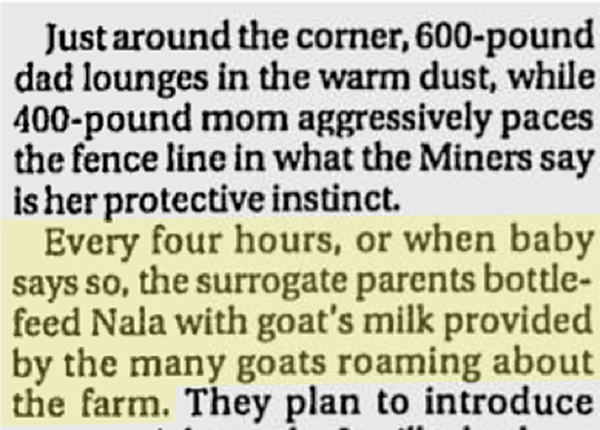 The Miners have admitted to local newspapers that their cubs are fed goat’s milk, an entirely inappropriate diet for a growing big cat which can cause malnourishment. This report also notes that a lion cub’s mother remained visibly agitated after having her baby stolen from her. 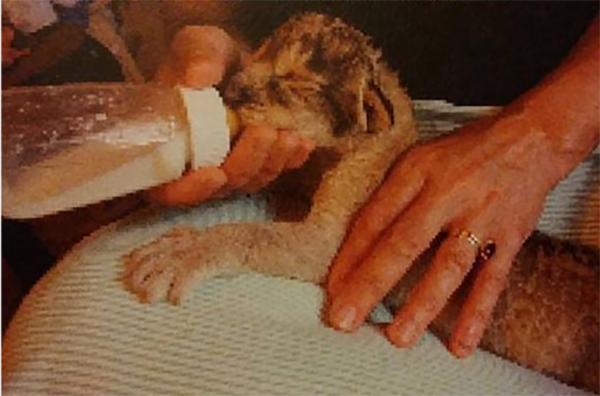 This tiny lion cub at DEW is very skinny and appears to be malnourished on a diet of goat’s milk. 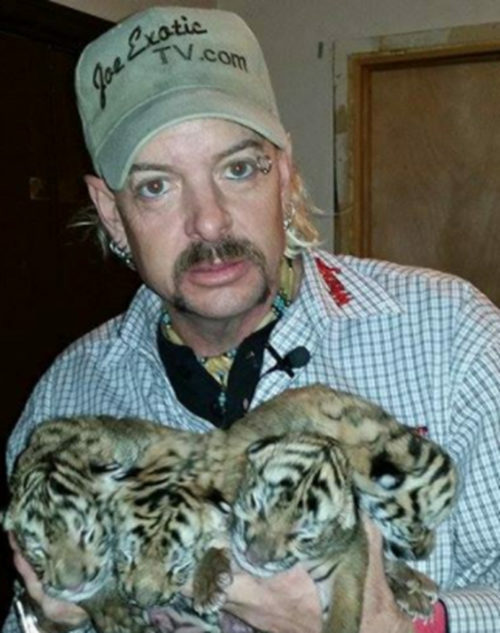 Bob Miner has bragged to tour groups about selling his cubs to circuses, and several of their cubs have ended up at Bear Path Acres, a notoriously abusive roadside zoo which had its license suspended in 2016 for severe and repeated violations of the Animal Welfare Act. 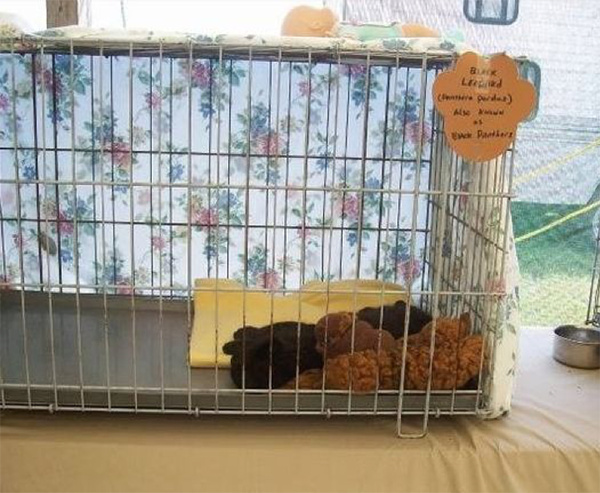 Born at DEW, this tiny black leopard cub was put on display at a local fair, after he was allegedly sold for $2,500 to Bear Path Acres. In 2014, Makeena gave birth to two litters of cubs, both of which were immediately taken from her to be handled and fed by paying customers. 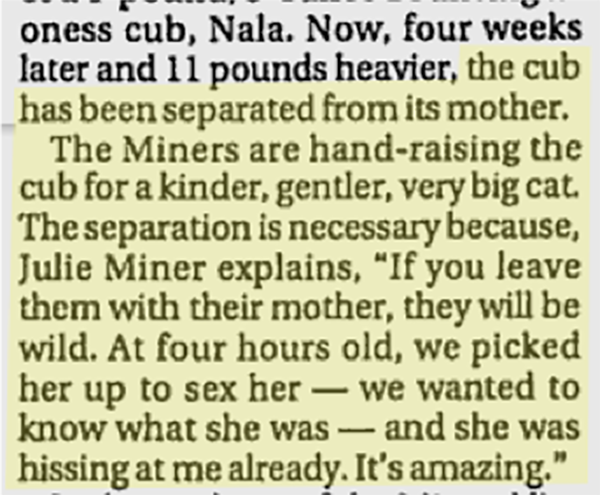 The Miners told the press and the public the common cub-petting lies: that the mother wasn’t caring for the cubs, that the cubs needed to “bond with people,” and that “they’ll go to nonprofit facilities focused on education and breeding programs because they are [an] endangered species.” Of the three cubs in one of Makeena’s litters, one white cub was euthanized due to birth defects caused by inbreeding, another white cub was “shipped out” to an undisclosed facility at just four weeks old, and the third, an orange cub named Aurora, “had trouble finding a buyer” and remained at the facility until the fall. 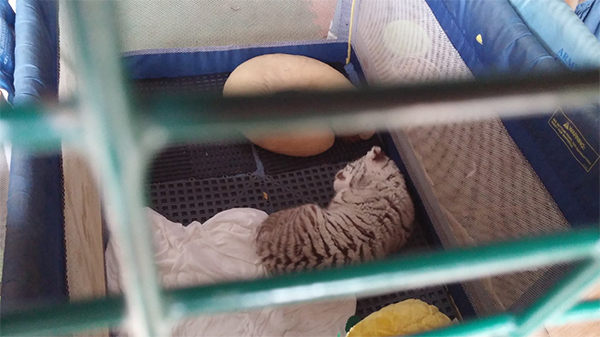 A volunteer was told the cub went to a facility that had advertised online looking for a tiger and was given away online in response to a Craigslist ad. 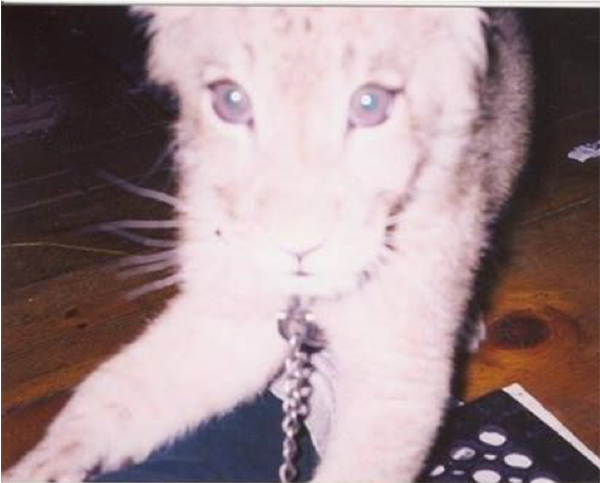 One of Makeena’s 4 week old cubs, before being euthanized due to claims of a congenital neurological condition. 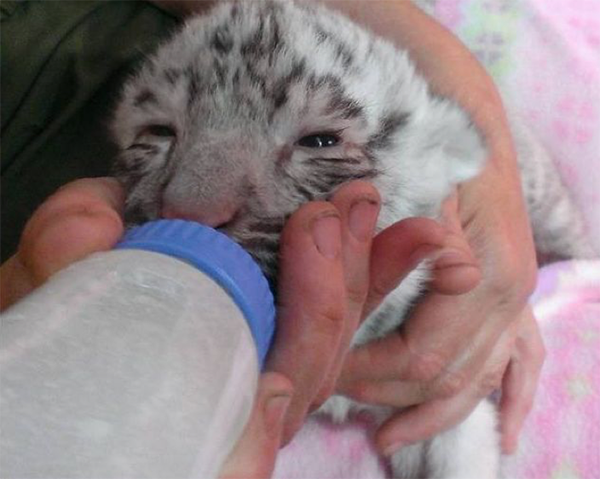 This cub is being fed illegally by a member of the public with dirty fingernails. Aurora, as a tiny cub before being given away on Craigslist. This newborn cub will never see his mother. A cub being used for petting screams at DEW. 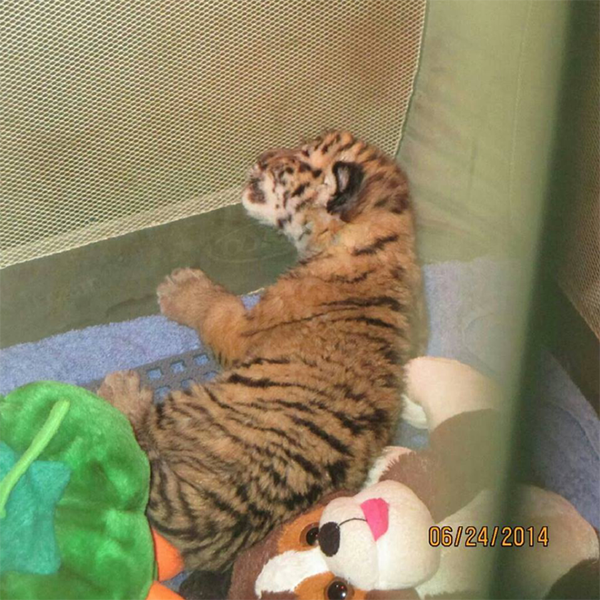 Newborn cubs are displayed in playpens at DEW. This exhausted cub wants to sleep. 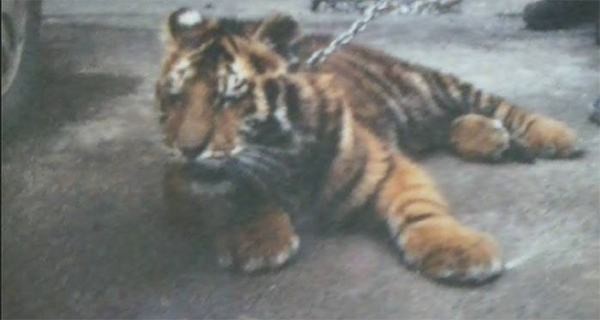 DEW also purchases cubs from substandard private zoos and tells the public that they were “rescued.” This tiger cub was purchased by the Miners from Robert Engesser’s notoriously abusive Jungle Safari traveling exhibit and kept in the Miner’s living room in violation of Maine law. 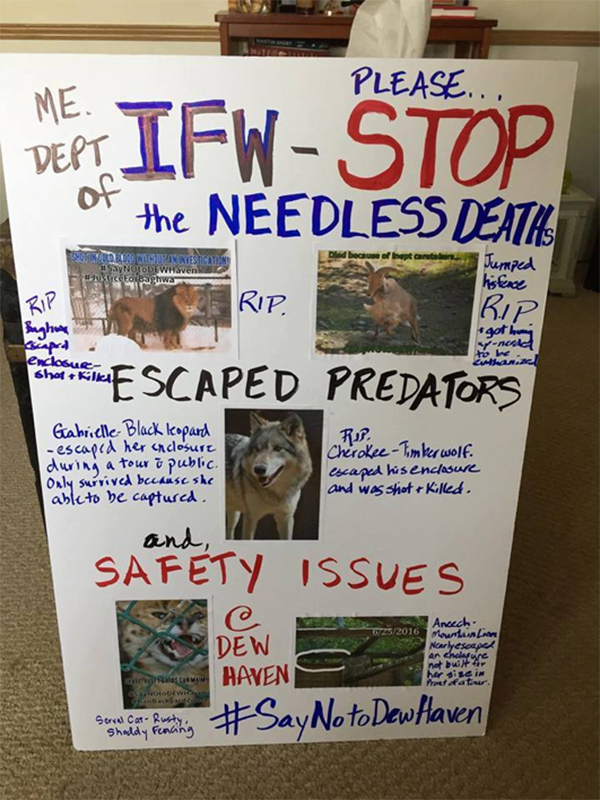 A protest sign by a former DEW volunteer details recent escapes. 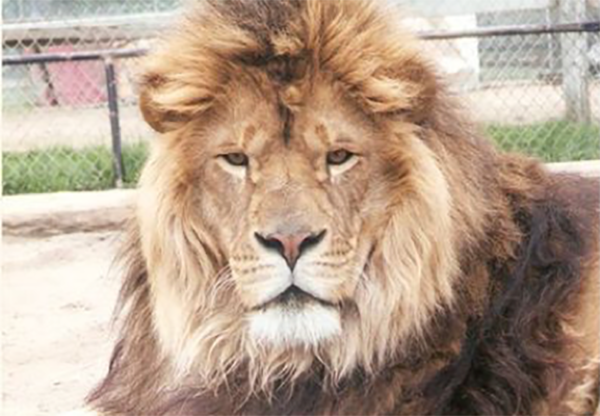 In 2003, an adult male lion named Baghwa escaped from his enclosure at night and ate the domestic fowl roaming the property. He was witnessed by a family member who was driving into the facility at the time and saw Baghwa’s eyes in the headlights of her van. The Miners reportedly spent the whole night trying to get Baghwa back into his enclosure. Sometime within the last 10 years, a black leopard named Gabrielle allegedly escaped her enclosure during a public tour and was safely re-captured. “The crowd was gathering around [Bob Miner]. There were probably 50 people total, mostly kids (maybe ages 7-10) from some organization, as they all had the same red t-shirt on. Miner threw a piece of meat over the fence into the tiger pen, and onto a 3 or 4 foot raised platform, that the tiger jumped up on to eat this meat. Miner was in-between the short barrier fence and the tiger’s enclosures chain link one. On June 25, 2016, a volunteer witnessed a cougar nearly escape in front of a tour group. 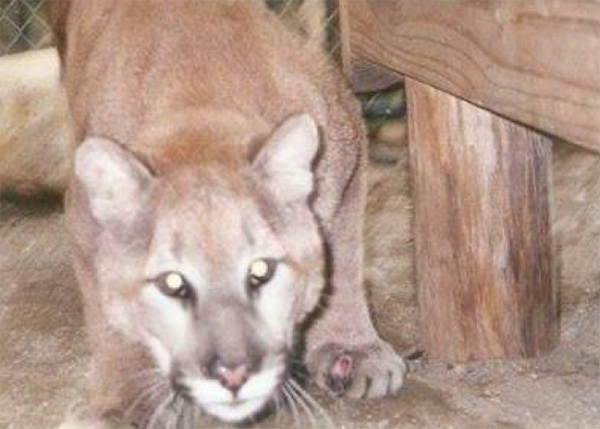 The enclosure was not designed to contain an animal the size of a full-grown cougar and had a gap between the walls and the roof almost large enough to allow the cat to slip through. 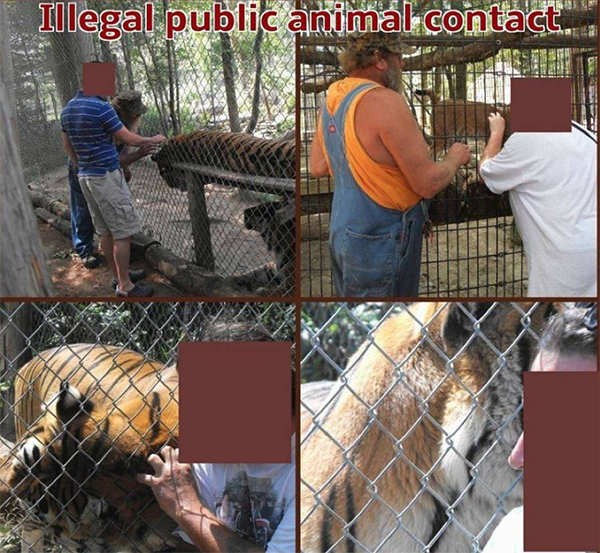 Bob Miner has continually disregarded laws which prohibit the public from having direct contact with large carnivores. 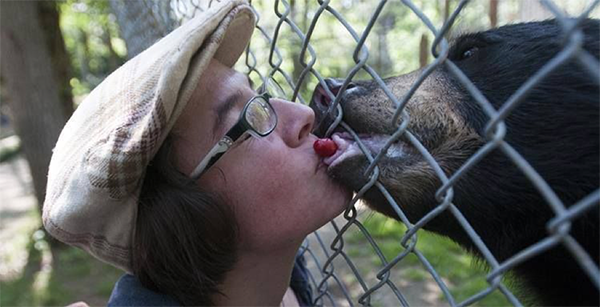 He has been cited by the USDA twice for allowing the public to enter the barrier fence to pose with and touch adult tigers, and famously encouraged the public to feed candy to his black bear from their mouths. 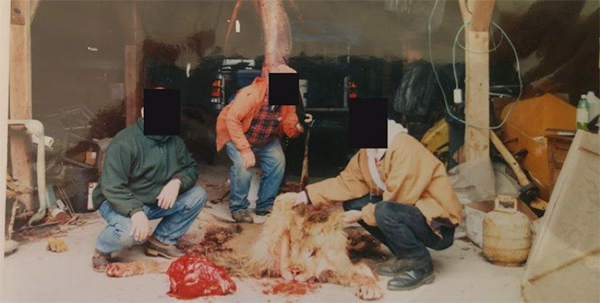 Facebook posts and other photos show that this dangerous behavior continues despite USDA citations. In April 2016, the Miners would not allow a reporter onto their property under the excuse that because it was the offseason, “not all safety measures are in place.” Safety measures must legally be in place at all times, not just when the public is present. In 1997, a report sent to Maine’s Department of Inland Fisheries and Wildlife records an incident where Bob and Julie brought a leashed 8-month old leopard to the state agriculture department office for employees to pat and play with. The report states that the large cub was “too rough with his teeth and claws” and that he “lunged and grabbed” an employee walking down the hallway, who claims that the cat’s “head and paws were around my midsection.” The employee was startled but unhurt. Boonyhea on a short chain in the Miner’s home. Although the Miners were aware that the cub was in distress, they left him to die in pain, with no medical treatment. Because Seren did not produce offspring, and she was not crippled and could retaliate against Bob Miner’s regular abuse for spectators, she attacked Miner. 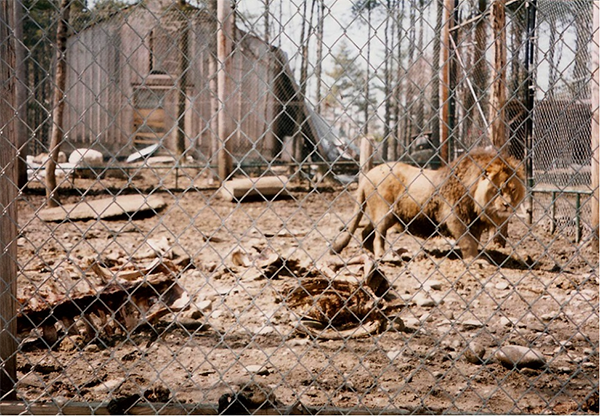 Miner escaped with injuries to his shoulder, and soon after, Seren was shot to death in her cage in the late summer of 2001, at the will of Bob Miner himself. A convicted felon who is not legally allowed to posses firearms, who admits mental instability and illness to his patrons every tour he gives. Seren was stuffed and sold by Miner. Her carcass is now in a local museum with a $1500 price tag. Seren, shot and sold by DEW. 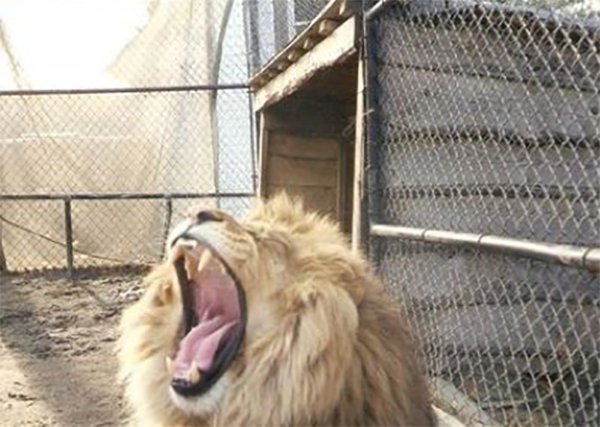 In 2005, a male lion named Baghwa was shot in his cage by Julie Miner. 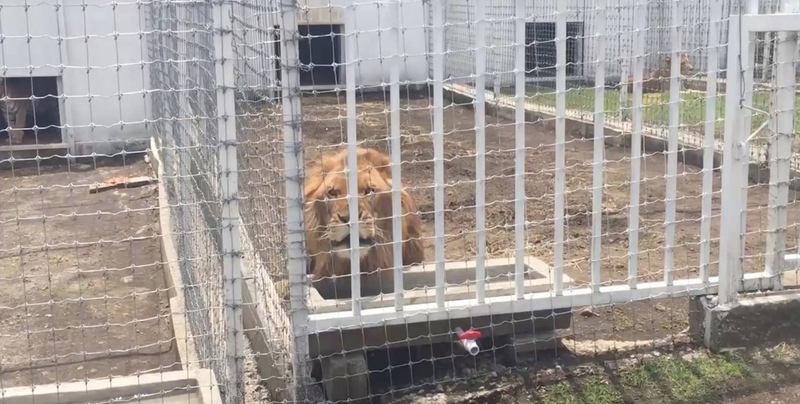 There are conflicting accounts about what led up to the incident, but they all agree that Bob Miner was in the cage with Baghwa during feeding time and had forgotten to lock a gate separating him from the lion. When Baghwa felt that his food was threatened (possibly because Bob had been trying to steal his food in order to tease him), he retaliated and started to bite Miner’s face. 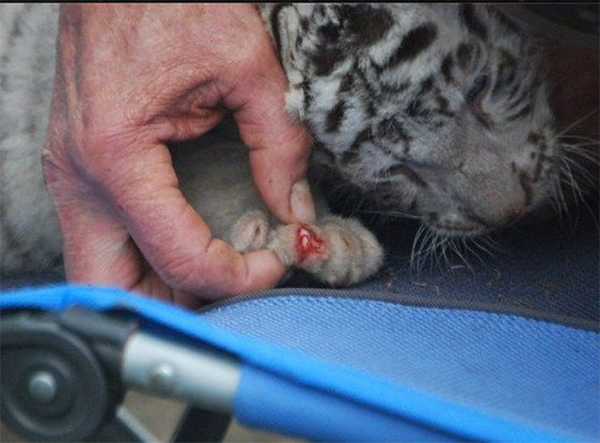 Miner then bit Baghwa and managed to escape the enclosure with injuries. 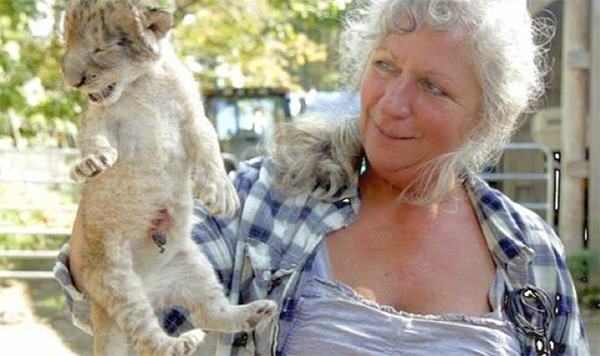 Julie Miner returned to the lion’s pen and shot him while Bob brought a backhoe to dispose of the carcass. Then, Julie drove Bob to the hospital. When asked by a tour group why Bob didn’t call 911, he replied, “Because then it would have been public knowledge and they probably would have shut me down.” Baghwa’s body was given to a local trapper’s club and skinned. Baghwa, before and after his death. 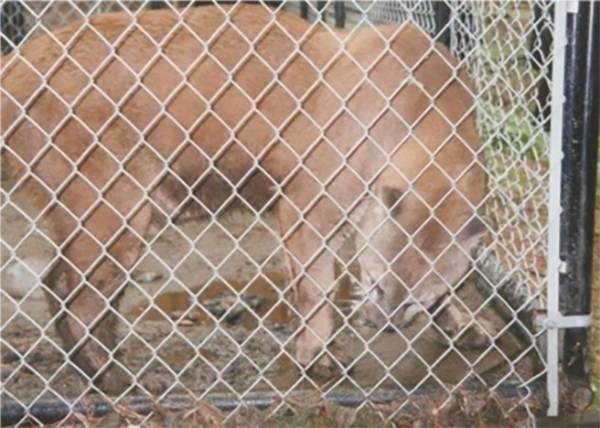 Like most pseudo-sanctuaries, the Miners have DEW Haven registered as a nonprofit organization and tug on the public’s heartstrings by claiming that they operate on a shoestring budget and can’t afford to improve their ramshackle enclosures unless more people donate. This story doesn’t match up with DEW’s 2015 tax returns, which reveal that the zoo had over $200,000 in assets (including over $120,000 in cash) and raked in nearly $90,000 of profit during that year alone. In 2015, $60,000 was spent on salaries for the Miners and their staff, while just $9,050 went to food and veterinary care for all 200+ animals living at DEW. 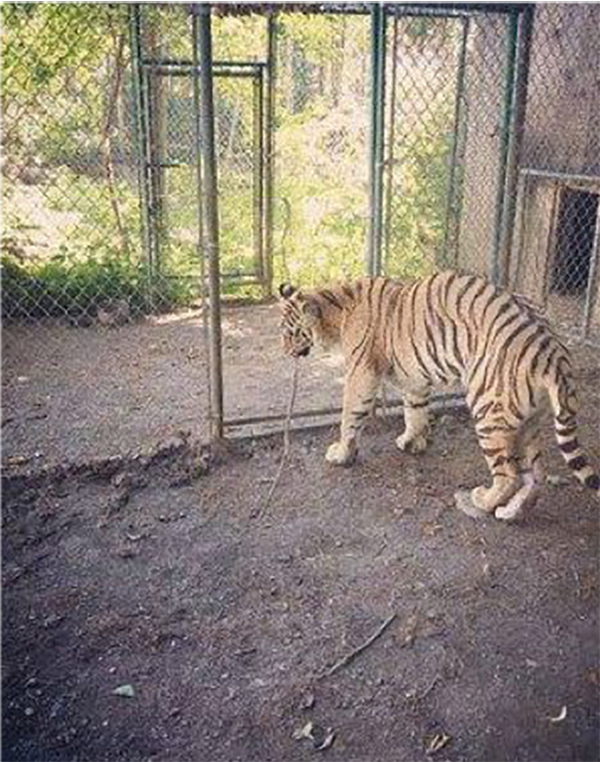 By comparison, a legitimate facility will typically spend roughly $10,000 each year to care for a single adult tiger. An expense report from DEW’s 2015 tax returns. Tax returns also show that DEW only attributed 11.4% of its 2015 income to public donations. The rest of the income, totaling almost $280,000, was obtained through “unrelated business activities,” defined as commercial activity not substantially related to furthering the exempt purpose of the organization — in DEW’s case, animal protection and welfare. “As Bob came to the Binturong [a nocturnal animal] that was sleeping on a raised up platform… …Bob had what looked like a metal sheet pan, and slammed the sheet pan on the fencing where the Binturong was sleeping, yelling, “Get UP! !”, and something about how they sleep a lot, playing to the crowd. For the Binturong, when the sheet pan hit the fence, it made a huge metal on metal noise and he jumped up scrambling for a second and looked frightened back and forth. It then slumped back down, like this happens all the time. It looked broken and depressed to me, not tired and sleepy.